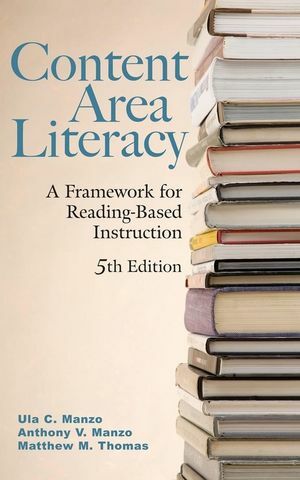 Content Area Literacy introduces teachers to the reasons for and means of promoting basic and higher-order literacy across the disciplines. The fifth edition has been updated to reflect new research, methods, data, and national trends relative to the field. It includes new aids that offer guidelines for reading actively, highlighting important material, and making personal marginal notes. Key standards are also integrated throughout the methods chapters and an appendix of the Standards of 6-8 major Professional Associations has been added. Teachers will gain a strong understanding of practical and user-friendly methods. Anthony V. Manzo is a very visible and respected researcher and scholar in education. Sometimes spoken of as "the person who discovered the 'cure' for comprehension deficits," Manzo pioneered the concepts of "mental modeling" and "reciprocal teaching"- two of the most generative and enduring ideas in pedagogy in the 20th century. He has written several books and many juried articles. Tony has also created several teacher-friendly instruments to aid in the assessment of thinking, reader styles, and social-emotional development. In 1993 he was granted the International Reading Association's Wm. S. Gray Citation of Merit, its highest award for lifetime creative research and problem-solving in the field. Reading-to-Learn: Whose Job Is It? Updated with the latest research, methods, data, and national trends. Methods for helping students improve their effectiveness during pre-reading, silent reading and post-reading.